It’s official. These meatballs are so good I’ve been making them weekly since last fall! When we run out, I have a need to make more. 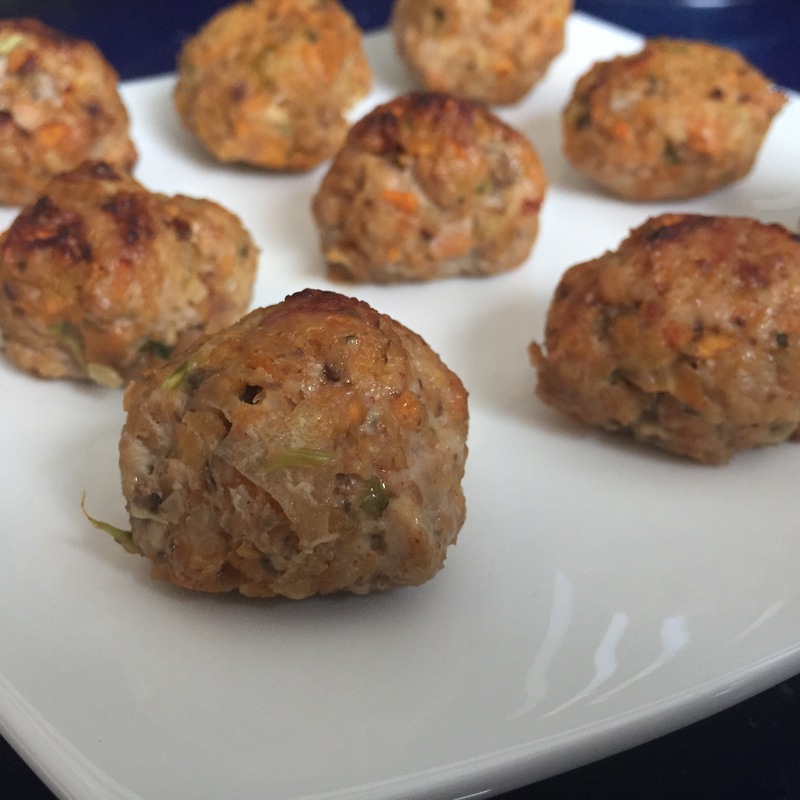 I was inspired by Michelle’s Asian Meatballs over at Nom Nom Paleo, where the original recipe uses ground beef, sweet potato, shiitake mushrooms, and cilantro. As those are all sorts of my favourite flavours, I had to give it a go. But with pork. And oh my word they’re awesome. The sweet potato acts as a gluten-free (and paleo!) binder here — keeping the meatballs together without the need for breadcrumbs. When I first saw fish sauce in the meatballs, I was confused, but I gave it a try, after reading Michelle’s explanation about umami (savoury taste). The results were delicious. And after just spending the last month in Asia (get a sneak peek at some of my pictures on instagram), it totally makes sense. Just a few drops adds salt and bumps up the savoury factor. And they smell sooooo good in the oven… not fishy at all! Chez KitchenOperas, we’ve been eating these with lingonberry jam (a sweet-tart jam normally served with Swedish meatballs), alongside a bed of stir-fried greens, or just popping them as snacks. They’re a great protein boost, so I often have a couple mid-afternoon when my energy starts to dip. Makes about 36 meatballs (1 1/2″ diameter). Preheat oven to 375F and line two sheet pans with parchment paper. Mince the mushrooms, onion, sweet potato, and cilantro (or blitz them all together in your food processor). Place in a large bowl, along with the pork, fish sauce, sea salt, and paprika, and mix with your hands until all ingredients are incorporated. Roll the mixture into 1 1/2″ diameter balls, and place on the parchment-lined sheet pans. Brush with the ghee (or coconut oil). Bake at 375F, turning once, until a thermometer inserted into a meatball reads at least 160F, about 30 minutes. Remove from oven and eat warm, or let cool and store in an airtight container in the fridge. I totally understand this situation — my husband and I are just two at home as well, so we want to make enough to feed us for a couple days, but not so much that we get sick of eating it. And I’m not afraid to cook a big batch of something and freeze half for later.